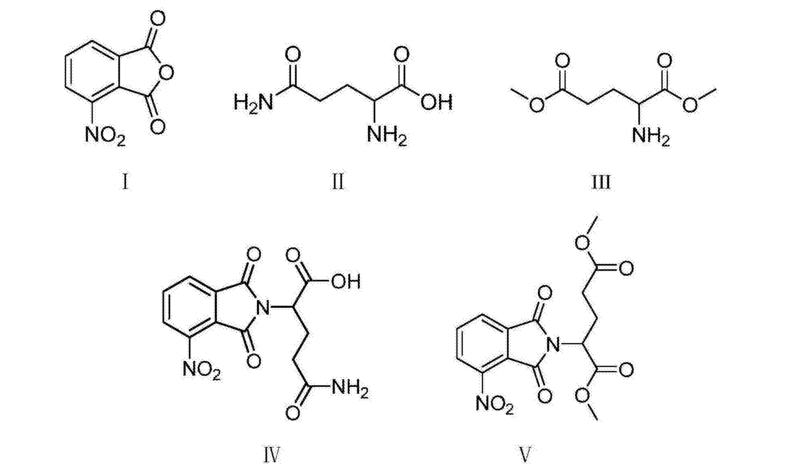 A preparation method of pomalidomide represented by formula (VII) comprises the following steps: 1, reacting 3-nitrophthalic anhydride represented by formula (I) with D,L-isoglutamine represented by formula (II) or dimethyl D,L-glutamate represented by formula (III) in the presence of an alkaline reagent to obtain a corresponding compound of formula (IV) or formula (V); 2, carrying out ring closure on the compound of formula (IV) or formula (V) to obtain a compound of formula (VI); and 3, carrying out nitro group reduction on the compound of formula (VI) to obtain pomalidomide represented by formula (VII). The method has the advantages of novel technological route, reasonable technological conditions, short reaction steps, simple operation, low production cost, high reaction yield, good product quality, low three wastes, and large enforcement values and social and economic effects. 多发性骨髓瘤（MM)是一种恶性浆细胞病，其肿瘤细胞起源于骨髓中的浆细胞，而浆细胞是B淋巴细胞发育到最终功能阶段的细胞。  Multiple myeloma (MM) is a malignant plasma cell disease, tumor cells originate in the bone marrow plasma cells, B lymphocytes and plasma cells develop to the final stage of cell function. 因此多发性骨髓瘤可以归到B淋巴细胞淋巴瘤的范围。 Thus multiple myeloma may be attributed to a range of B cell lymphomas. 临床表现主要有贫血、骨痛、肾功能不全、感染、出血、神经症状、高钙血症、 淀粉样变等。 The main clinical manifestations of anemia, bone pain, renal failure, infection, bleeding, neurological symptoms, hypercalcemia, amyloidosis. 多发性骨髓瘤发病率约为2-3/10万，男女比例为1.6 :1，大多患者年龄>40 岁。 The incidence of multiple myeloma is about 2-3 / 100,000 female ratio was 1.6: 1, most patients aged> 40 years old. 泊马度胺（Pomalidomide)是沙利度胺类似物，具有抗肿瘤活性，能够抑制造血肿瘤细胞增生并诱导细胞凋亡。  Ma poise thalidomide (Pomalidomide) is thalidomide analogs having anti-tumor activity, hematopoietic tumors capable of inhibiting cell proliferation and induce apoptosis. 另外，泊马度胺能抑制耐来那度胺的多发性骨髓瘤细胞株增生，能与地塞米松协同诱导肿瘤细胞凋亡。 Further, the amine can be suppressed poise MA degree resistant to lenalidomide proliferation of multiple myeloma cell lines, can be synergistic with dexamethasone-induced apoptosis. 泊马度胺还能增强T细胞和自然杀伤细胞介导的免疫反应，同时抑制单核细胞产生促炎性细胞因子（如TNF-α、IL-6)。 Ma poise thalidomide can enhance the immune response of T cells and natural killer cells mediated, while inhibiting monocyte production of proinflammatory cytokines (e.g., TNF-α, IL-6). 泊马度胺是继沙利度胺（Thalidomide)、来那度胺（Lenalidomide)后第三个度胺类药物，主要用于对来那度胺、硼替佐米耐药的患者。  The following amines are poise MA degree thalidomide (Thalidomide), after lenalidomide (Lenalidomide) third degree amine drugs, primarily for the patient lenalidomide, bortezomib resistant. 2013年2月8日泊马度胺在美国被首次批准上市。 February 8, 2013 Park horse thalidomide was first approved in the United States. 作为治疗多发性骨髓瘤耐药的换代产品，其市场前景广阔。 As a treatment for multiple myeloma resistant replacement products, its market prospects. 目前，泊马度胺的合成主要以N-苄氧羰基-L-谷氨酰胺为起始原料，四氢呋喃为溶剂，以Ν，Ν'-羰基二咪唑（CDI)为缩合剂环合，再用溴化氢醋酸溶液脱去苄氧羰基(CBZ)并成盐制备得到3-氨基哌啶-2, 6-二酮氢溴酸盐，3-氨基哌啶-2, 6-二酮氢溴酸盐再与3-硝基邻苯二甲酸酐缩合，再钯碳还原硝基为氨基制得泊马度胺。  Currently, the synthesis of the amine Ma poise mainly N- benzyloxycarbonyl -L- glutamine as a starting material and tetrahydrofuran as solvent, Ν, Ν'- carbonyl diimidazole (CDI) as a condensing agent cyclization , hydrogen bromide acetic acid solution and then removed benzyloxycarbonyl (CBZ) and prepared into a salt to give 3-amino-piperidine-2,6-dione hydrobromide, 3-amino-piperidine-2,6-dione hydrobromide and then with 3-nitro phthalic anhydride condensation, palladium on carbon and then reducing the nitro group to an amino group of the amine prepared poise horse. 但该方法(Bioorg. Med. Chem. Lett. 9,1625(1999))存在反应周期长、反应需要加压氢化等不易实现工业化的缺点，且最终产品纯度不高，仅约为85%。 However, the method (Bioorg. Med. Chem. Lett. 9,1625 (1999)) the presence of long reaction period, the reaction pressure need not easy to industrialize disadvantage hydride, and the final product purity is not high, only about 85%. 因此，提供一种反应周期短、产品纯度高的泊马度胺制备方法具有重要的现实意义。 Thus, with short reaction period, a high purity preparation of thalidomide poise horse has important practical significance. 本发明的目的是提供一种泊马度胺的制备方法，该制备方法周期短，产品纯度高， 收率高，无需精制即可达到单杂均小于〇. 1 %，更适于工业化大生产。  The object of the present invention is to provide a horse poise preparation of amines, the preparation cycle is short, high product purity, high yield can be achieved without purification single square heteroaryl less than 1%, more suitable industrial production. 进一步，步骤（1)中，所述的碱性试剂选自醋酸钠、醋酸钾、醋酸胺、三乙胺、碳酸氢钠、二异丙基乙胺中的一种或几种混合物；最优选为醋酸钠。  Further, the step (1), the alkaline agent is selected from sodium acetate, potassium acetate, ammonium acetate, triethylamine, sodium bicarbonate, a mixture of one or more of diisopropylethylamine said ; and most preferably sodium acetate. 进一步，步骤（1)的反应在反应溶剂A中进行，所述反应溶剂A选自醋酸、N，N_二甲基甲酰胺（DMF)、N，N-二甲基乙酰胺（DMAC)、乙腈、丙酮中的一种或者几种的混合物；优选为醋酸或N，N-二甲基甲酰胺；最优选为醋酸。  Further, the reaction in step (1) A solvent in the reaction, the reaction solvent A is selected from acetate, N, N_-dimethylformamide (DMF), N, N- dimethylacetamide ( DMAC), acetonitrile, acetone, one kind or a mixture of several of; preferably acetic acid or N, N- dimethylformamide; most preferably acetic acid. 进一步，步骤（1)中，3-硝基邻苯二甲酸酐与D，L_异谷氨酰胺或D，L_谷氨酸二甲酯、碱性试剂的投料摩尔比为2 :1~2 :1~2。  Further, the step (1), 3-nitro phthalic anhydride and D, L_ isoglutamine or D, L_-glutamate, the feed molar ratio of alkaline reagent 2 : 1 ~ 2: 1 ~ 2. 进一步，步骤（1)中，反应在室温~溶剂的回流温度范围内进行，优选反应温度为80°C~溶剂的回流温度，最优反应温度是溶剂的回流温度。  Further, the step (1), the reaction at room temperature to the reflux temperature of the solvent, preferably the reaction temperature is 80 ° C ~ the reflux temperature of the solvent, the optimum reaction temperature is the reflux temperature of the solvent. 进一步，步骤（1)在反应完全后，反应混合物冷却至室温过滤、水洗、干燥，即可得到式（IV)或式（V)化合物。  Further, the step (1) After completion of the reaction, the reaction mixture was cooled to room temperature and filtered, washed with water, and dried to obtain of formula (IV) or Formula (V) compound. 进一步，步骤（2)中，式（IV)化合物关环得到式（VI)化合物的反应在反应溶剂B中在关环试剂A作用下进行。  Further, the step (2), the compound of formula (IV) ring closure to give the formula (VI) compound in a reaction solvent A reagent B action in the ring closure. 关环试剂A选自氯化亚砜、二环己基碳二亚胺（DCC)、三氯氧磷或Ν，Ν'-羰基二咪唑（CDI)，优选为氯化亚砜；式（IV)化合物与关环试剂A的投料摩尔比为1 :1~3。 A ring closing reagent is selected from thionyl chloride, dicyclohexyl carbodiimide (DCC), phosphorus oxychloride or Ν, Ν'- carbonyl diimidazole (CDI), preferably thionyl chloride; of formula (IV) compound cyclization reagent a molar ratio of the feed is 1: 1 ~ 3. 反应溶剂B选自干燥的N，N-二甲基甲酰胺、N，N-二甲基乙酰胺、四氢呋喃、卤代烃中的一种或者几种的混合物，优选为N，N-二甲基甲酰胺或N，N-二甲基乙酰胺， 最优溶剂为N，N-二甲基甲酰胺。 B is selected from the dried reaction solvent of N, N- dimethylformamide, N, N- dimethylacetamide, tetrahydrofuran, a halogenated hydrocarbon of one or several, and preferably N, N- dimethyl formamide or N, N- dimethylacetamide, and most solvent is N, N- dimethylformamide. 进一步，步骤（2)中，式（IV)化合物关环得到式（VI)化合物的反应在-40~ 80°C之间进行，优选在-30~40°C之间，最优选在-20~20°C之间反应。  Further, the step (2), the compound of formula (IV) ring closure to give the formula (VI) in the reaction between the compounds of -40 ~ 80 ° C, preferably between -30 ~ 40 ° C, most preferably the reaction between -20 ~ 20 ° C.
进一步，步骤（2)中，式（IV)化合物的关环反应完全后，反应液倒入快速搅拌的冰水中，经乙酸乙酯萃取、无水硫酸钠干燥后将所得母液减压浓缩至干，然后于醋酸中搅拌1~5小时，再经过滤、水洗、干燥即可得到式（VI)化合物。  Further, the step (2), the ring closure reaction of a compound of formula (IV) After completion, the reaction solution was poured into rapidly stirred ice water, extracted with ethyl acetate, dried over anhydrous sodium sulfate mother liquor obtained after reduced pressure concentrated to dryness, and then in acetic acid was stirred for 1-5 hours, then filtered, washed with water, and dried to obtain the compound of formula (VI). 进一步，步骤（2)中，式（V)化合物关环得到式（VI)化合物的反应是在反应溶剂C中在关环试剂B作用下进行。  Further, the step (2), Formula (V) ring closure to give a compound of formula (VI) in the reaction of a compound C in a reaction solvent in the ring closure reagent B action under. 关环试剂B选自氨基钠、氨基钾或氨基锂，优选为氨基钠；式（V)化合物与关环试剂B的投料摩尔比为1 :1~3。 B ring closing reagent is selected from sodium amide, potassium amide or lithium amide, preferably sodium amide; compound of formula (V) with a ring closure reagent molar feed ratio of B is 1: 1 ~ 3. 反应溶剂C选自干燥的N，N-二甲基甲酰胺、N，N-二甲基乙酰胺的一种或者两种的混合物，优选使用N，N-二甲基甲酰胺或N，N-二甲基乙酰胺，最优溶剂为N，N-二甲基甲酰胺。 The reaction solvent is selected from C dry N, N- dimethylformamide, N, N- dimethylacetamide one kind or a mixture of the two, preferably using N, N- dimethylformamide or N, N - dimethylacetamide, and most solvent is N, N- dimethylformamide. 进一步，步骤（2)中，式（V)化合物关环得到式（VI)化合物的反应在50°C~ 250°C之间进行，优选在50°C~150°C之间，最优选在120°C~150°C之间进行。  Further, the step (2), the compound of formula (V) to give ring closure of formula (VI) compound in the reaction between 50 ° C ~ 250 ° C, preferably between 50 ° C ~ 150 ° C, most preferably between 120 ° C ~ 150 ° C.
 进一步，步骤（2)中，式（V)化合物的关环反应完全后，反应液减压浓缩后倒入快速搅拌的冰水中，析出固体后过滤，滤饼在醋酸中搅拌1~3小时，过滤、水洗、干燥即得到式（VI)化合物。  Further, the step (2), the ring closure reaction of a compound of formula (V) was completed, the reaction solution was concentrated under reduced pressure and poured into a rapidly stirred ice water, the precipitated solid was filtered, the filter cake was stirred in acetic acid 1 3 hours, filtered, washed with water, and dried to obtain compound (VI) of formula. 本发明步骤（3)中，所述的硝基还原可采用文献报道的方法进行，例如以铁粉、锌粉、硫化钠、保险粉、H2、甲酸铵等作为还原剂，以镍、钯碳、钼碳等作为催化剂。  The steps of the present invention (3), the method of reducing the nitro group is reported in the literature can be employed, for example, iron, zinc, sodium sulfide, sodium hydrosulfite, H2, ammonium formate as the reducing agent and the like, nickel , palladium on carbon, molybdenum, carbon or the like as a catalyst. 进一步，步骤（3)中，所述硝基还原优选以钯炭为催化剂，以凡或甲酸铵为还原剂。  Further, step (3), the nitro group is reduced to preferably palladium on carbon as catalyst, or where the reducing agent is ammonium formate. 进一步，步骤（3)中，硝基还原反应在反应溶剂D中进行，所述反应溶剂D选自丙酮、甲醇、乙醇、四氢呋喃、N，N-二甲基甲酰胺、N，N-二甲基乙酰胺、醋酸中的一种或几种的混合物，优选使用丙酮、甲醇、四氢呋喃中的一种或几种的混合物，最优溶剂为甲醇。  Further, step (3), a nitro group reduction reaction is carried out in a reaction solvent D, D the reaction solvent is selected from acetone, methanol, ethanol, tetrahydrofuran, N, N- dimethylformamide, N, N - dimethylacetamide, mixture of one or more of acetic acid, preferably a mixture of one or more of acetone, methanol, tetrahydrofuran, optimum solvent is methanol. 进一步，步骤（3)中，硝基还原反应在室温~50°C之间进行，优选温度为25~ 50°C，最优选温度为30~40°C。  Further, step (3), a nitro group reduction reaction is carried out between room temperature ~ 50 ° C, preferably at a temperature of 25 ~ 50 ° C, most preferably at a temperature of 30 ~ 40 ° C.
 (3)在甲醇中加入式（VI)化合物和钯炭催化剂，加入甲酸铵或者通入氢气作为还原剂，于30~40°C进行硝基还原反应，得到式（VII)所示的泊马度胺。  (3) was added of formula (VI) compound and palladium on carbon catalyst, or by ammonium formate in methanol with hydrogen as a reducing agent, to the nitro group reduction reaction is 30 ~ 40 ° C, to give formula (VII) shown in FIG. thalidomide mooring horse. 与现有技术相比，本发明的有益效果在于：本发明工艺路线新颖，工艺条件合理， 反应步骤短，操作简单，生产成本低，反应收率高，产物质量好，三废低，具有较大的实施价值和社会经济效应。  Compared with the prior art, the beneficial effects of the present invention is that: the present invention is a novel process route, and reasonable conditions, the reaction step is short, simple operation, low cost, high reaction yield, better product quality, low waste, It has a larger implementation value and socio-economic effects. 图1-图4分别是实施例1-4制得的泊马度胺产物的HPLC图。  FIGS. 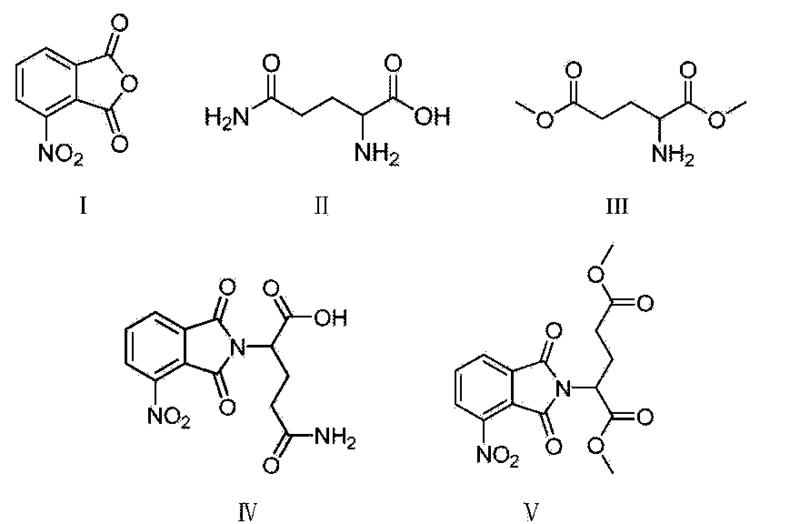 1-4 are HPLC chart obtained in Examples 1-4 poise horse embodiment of amine product. 具体实施例方式下面再以实施例的方式对本发明做进一步的说明，给出本发明的实施细节，但是并不是旨在限定本发明的保护范围。  DETAILED DESCRIPTION The following Examples further embodiment by way of example of further explanation of the invention, are given details of the embodiment of the present invention, but not intended to limit the scope of the present invention. 3-硝基邻苯二甲酸酐19. 32g，D，L-异谷氨酰胺14. 62g，醋酸钠8. 92g，醋酸100ml 中进行搅拌，回流反应，保持搅拌反应7小时，冷却至室温过滤，水洗，干燥，得到灰色固体29. 86g，收率93. 2%。  3-nitro phthalic anhydride 19. 32g, D, L- isoglutamine 14. 62g, sodium acetate 8. 92g, 100ml of acetic acid was stirred and refluxed the reaction, maintaining the reaction stirred for 7 hours, cooled to room temperature, filtered, washed with water, and dried to give a gray solid 29. 86g, yield 93.2%. NMR (500MHz，CDC13) δ 14. 41 (s，1H)，1 1. 48 (s，1H)，8. 12 (dd, J = 7. 5, 2. 0Hz, 1H) , 7. 87 (dd, J = 7. 5, 2. 0Hz, 1H) , 7. 73 (t, J = 7. 5Hz, 1H), 7. 45 (s, 1H), 4. 51 (dt, J = 5. 8, 1. 1Hz, 1H), 3. 19 - 3. 10 (m, 1H), 2. 96 (ddd, J =12. 4, 9. 0, 7. 6Hz, 1H), 2. 08 (dtd, J = 12. 4, 8. 9, 5. 8Hz, 1H), 1. 63 (ddt, J = 12. 4, 7. 7, 1. 4Hz, 1H). NMR (500MHz, CDC13) δ 14. 41 (s, 1H), 1 1. 48 (s, 1H), 8. 12 (dd, J = 7. 5, 2. 0Hz, 1H), 7. 87 (dd, J = 7. 5, 2. 0Hz, 1H), 7. 73 (t, J = 7. 5Hz, 1H), 7. 45 (s, 1H), 4. 51 (dt, J = 5 . 8, 1. 1Hz, 1H), 3. 19 -. 3. 10 (m, 1H), 2. 96 (ddd, J = 12 4, 9. 0, 7. 6Hz, 1H), 2. 08 ( dtd, J = 12. 4, 8. 9, 5. 8Hz, 1H), 1. 63 (ddt, J = 12. 4, 7. 7, 1. 4Hz, 1H). 在反应瓶中加入lOg式IV化合物，DMF30ml，于-20°C搅拌下滴加氯化亚砜5g。  lOg compound of Formula IV is added to the reaction flask, DMF30ml, stirred at -20 ° C was added dropwise thionyl chloride 5g. 保温反应2-3小时。 Reaction was incubated for 2-3 hours. 反应液倒入快速搅拌的冰水中，2X50ml乙酸乙酯萃取，无水硫酸钠干燥。 The reaction solution was poured into rapidly stirred ice water, extracted with 2 X 50 ml of ethyl acetate, dried over anhydrous sodium sulfate. 过滤除去硫酸钠，母液减压浓缩至干。 Sodium sulfate was removed by filtration, the mother liquor was concentrated to dryness under reduced pressure. 醋酸中常温搅拌一小时，过滤，水洗，干燥，得到产物6. 95g，收率73. 6%。 Acetic acid was stirred for one hour at room temperature, filtered, washed with water and dried to give product 6. 95g, 73. 6% yield. 4 MMR(500MHz，DMS0-d6) δ 11. 19(s，1H)，8. 36(d，J = 8. 0Hz，1H)，8. 25(d，J =7. 3Hz, 1H), 8. 13(t, J = 7. 8Hz, 1H), 5. 22 (dd, J = 12. 9, 5. 4Hz, 1H), 2. 90 (ddd, J = 17. 2, 13. 9, 5. 4Hz, 1H),2. 67 - 2. 51 (m, 2H),2. 09 (dtd, J = 13. 1, 5. 4, 2. 4Hz, 1H). 4 MMR (500MHz, DMS0-d6) δ 11. 19 (s, 1H), 8. 36 (d, J = 8. 0Hz, 1H), 8. 25 (d, J = 7. 3Hz, 1H ), 8. 13 (t, J = 7. 8Hz, 1H), 5. 22 (dd, J = 12. 9, 5. 4Hz, 1H), 2. 90 (ddd, J = 17. 2, 13. 9, 5. 4Hz, 1H), 2 67 -. 2. 51 (m, 2H), 2 09 (dtd, J = 13. 1, 5. 4, 2. 4Hz, 1H)..
 将式VI化合物5. 02g在甲醇50ml中，加入10%钯碳0. 51g，甲酸铵8. 31g，40°C下搅拌反应3小时，过滤，滤饼溶于二甲基亚砜20ml中，滤除钯碳，滤液加入水100ml中，搅拌析出固体，水洗滤饼，干燥得到产物3. 51g，收率77. 6 %，纯度99. 92 %。  The compound of formula VI 5. 02g in 50ml of methanol was added 10% palladium carbon 0. 51g, ammonium formate and stirred at 8. 31g, 40 ° C for 3 hours, filtered, the filter cake was dissolved in dimethyl sulfoxide 20ml, the palladium on carbon was filtered off, the filtrate was added 100ml of water and stirred to precipitate a solid, the filter cake was washed with water, and dried to give product 3. 51g, 77. 6% yield, 99.92% purity. 3-硝基邻苯二甲酸酐19. 32g，D，L_谷氨酸二甲酯17.6g，醋酸钠8.92g，醋酸100ml中进行搅拌，回流反应，保持搅拌反应7小时，冷却至室温过滤，水洗，干燥，得到灰色固体，过滤，干燥，得到产物34. 16g，收率97. 6 %。  3-nitro phthalic anhydride 19. 32g, D, L_ 17.6 g of dimethyl glutamate, sodium acetate 8.92g, 100ml of acetic acid was stirred and refluxed the reaction, maintaining the reaction stirred for 7 hours, cooled to room temperature, filtered, washed with water and dried to give a gray solid was filtered and dried to give the product 34. 16g, 97. 6% yield. NMR(500MHz, DMS〇-d6) δ 8. 11 (dd, J = 7. 4, 1. 9Hz, 1H) , 8. 03 (dd, J =7. 4, 1. 9Hz, 1H),7. 74 (t, J = 7. 4Hz, 1H),4. 29 (t, J = 6. 9Hz, 1H),3. 64 (d, J =10. 2Hz, 6H) , 2. 77 (ddd, J = 12. 3, 5.2,1. 8Hz, 1H) , 2. 55 (td, J = 12. 1, 4. 5Hz, 1H) , 2. 46 (dddd, J = 11. 8, 6. 7, 4. 7, 1. 9Hz, 1H) , 2. 29 (tdd, J = 12. 2, 6. 9, 5. 2Hz, 1H). NMR (500MHz, DMS〇-d6) δ 8. 11 (dd, J = 7. 4, 1. 9Hz, 1H), 8. 03 (dd, J = 7. 4, 1. 9Hz, 1H) , 7. 74 (t, J = 7. 4Hz, 1H), 4. 29 (t, J = 6. 9Hz, 1H), 3. 64 (d, J = 10. 2Hz, 6H), 2. 77 ( ddd, J = 12. 3, 5.2,1. 8Hz, 1H), 2. 55 (td, J = 12. 1, 4. 5Hz, 1H), 2. 46 (dddd, J = 11. 8, 6. 7, 4. 7, 1. 9Hz, 1H), 2. 29 (tdd, J = 12. 2, 6. 9, 5. 2Hz, 1H). 在反应瓶中加入30g式V化合物，DMFlOOml，氨基钠0. 41g。  30g of formula V compound is added to the reaction flask, DMFlOOml, sodium amide 0. 41g. 150°C保温反应5小时。 150 ° C incubation for 5 hours. 反应液60°C减压浓缩，倒入快速搅拌的冰水中，析出紫色固体。 The reaction solution was concentrated under reduced pressure to 60 ° C, poured into rapidly stirred ice water to precipitate a purple solid. 过滤，滤饼在醋酸中常温搅拌一小时，过滤，水洗，干燥，得到产物20. 41g，收率78. 6%。 The filter cake was stirred in acetic acid at room temperature for an hour, filtered, washed with water, and dried to give the product 20. 41g, 78. 6% yield. 4匪R(500MHz，DMS0-d6) δ 11. 21 (s，1H), 8. 40(d，J = 8. 0Hz，1H)，8. 27(d，J =7. 3Hz, 1H), 8. 16(t, J = 7. 8Hz, 1H),5. 25 (dd, J = 12. 9, 5. 4Hz, 1H),2. 93 (ddd, J = 17. 2, 13. 9, 5. 4Hz, 1H), 2. 67 - 2. 51 (m, 2H), 2. ll(dtd, J = 13. 1, 5. 4, 2. 4Hz, 1H). 4 bandit R (500MHz, DMS0-d6) δ 11. 21 (s, 1H), 8. 40 (d, J = 8. 0Hz, 1H), 8. 27 (d, J = 7. 3Hz, 1H), 8. 16 (t, J = 7. 8Hz, 1H), 5. 25 (dd, J = 12. 9, 5. 4Hz, 1H), 2. 93 (ddd, J = 17. 2, 13 . 9, 5. 4Hz, 1H), 2. 67 - 2. 51 (m, 2H), 2. ll (dtd, J = 13. 1, 5. 4, 2. 4Hz, 1H). 将式VI化合物10.03g在甲醇100ml中，加入10%钯碳1.llg，甲酸铵8. 31g，40°C 下搅拌反应3小时，过滤，滤饼溶于二甲基亚砜20ml中，滤除钯碳，滤液加入水100ml中，搅拌析出固体，水洗滤饼，干燥得到产物7. 03g，收率77. 65 %，纯度99. 96 %。  The compound of formula VI 10.03g in 100ml of methanol was added 10% palladium carbon 1.llg, ammonium formate and stirred at 8. 31g, 40 ° C for 3 hours, filtered, the filter cake was dissolved in dimethyl sulfoxide 20ml , the palladium on carbon was filtered off, the filtrate was added 100ml of water and stirred to precipitate a solid, the filter cake was washed with water, and dried to give the product 7. 03g, 77. 65% yield, 99.96% purity. MS(ESI)m/e(M+H+)274。  MS (ESI) m / e (M + H +) 274. 3-硝基邻苯二甲酸酐19. 66g，D, L-异谷氨酰胺14. 73g，三乙胺3. 68g，DMFlOOml 中进行搅拌，回流反应，保持搅拌反应9小时，冷却至室温过滤，水洗，干燥，得到灰色固体23. 89g，收率74. 56%。  3-nitro phthalic anhydride 19. 66g, D, L- isoglutamine 14. 73g, triethylamine 3. 68g, DMFlOOml by stirring, refluxing, the reaction was held for 9 hours, cooled to room temperature, filtered, washed with water, and dried to give a gray solid 23. 89g, 74. 56% yield. 在反应瓶中加入10g式IV化合物，四氢呋喃50ml，于10°C搅拌下分批加入⑶113. 12g。  10g compound of Formula IV is added to the reaction flask, tetrahydrofuran 50ml, stirring at 10 ° C was added portionwise ⑶113. 12g. 加料完毕后，回流反应2~3小时。 After the addition was complete, the reaction was refluxed for 2 to 3 hours. 浓缩后，倒入快速搅拌的冰水中，2X50ml 乙酸乙酯萃取，无水硫酸钠干燥。 After concentration, poured into rapidly stirred ice water, extracted with 2 X 50 ml of ethyl acetate, dried over anhydrous sodium sulfate. 过滤除去硫酸钠，母液减压浓缩至干。 Sodium sulfate was removed by filtration, the mother liquor was concentrated to dryness under reduced pressure. 醋酸中常温搅拌一小时，过滤，水洗，干燥，得到产物4. 17g，收率44. 2%。 Acetic acid was stirred for one hour at room temperature, filtered, washed with water, and dried to give the product 4. 17g, 44. 2% yield. 将式¥1化合物58溶于010710〇1111中，加入10%把碳0.5]^，通氢气约3~4个大气压下，室温搅拌反应2小时，滤除钯碳，滤液活性炭脱色，滤除活性炭后滤液加入水100ml 中，搅拌析出固体，水洗滤饼，干燥得到产物2. 63g，收率58. 2 %，纯度99. 89 %。  The compound of formula 58 was dissolved 010710〇1111 ¥ 1 was added to 10% carbon 0.5] ^, pass under the hydrogen pressure of about 3-4 atmospheres, the reaction was stirred for 2 hours at room temperature, palladium-carbon was filtered off, the filtrate was decolorized with charcoal after the activated carbon was filtered off and the filtrate was added 100ml of water and stirred to precipitate a solid, the filter cake was washed with water, and dried to give product 2. 63g, 58.2% yield, 99.89% purity. 3-硝基邻苯二甲酸酐19. 13g，D，L-谷氨酸二甲酯17.77g，醋酸铵7.92g，醋酸100ml中进行搅拌，回流反应，保持搅拌反应7小时，冷却至室温过滤，水洗，干燥，得到灰色固体，过滤，干燥，得到产物31. 77g，收率90. 77%。  3-nitro phthalic anhydride 19. 13g, D, L- glutamic acid dimethyl ester 17.77g, ammonium acetate 7.92g, 100ml of acetic acid was stirred and refluxed the reaction, maintaining the reaction stirred for 7 hours, cooled to room temperature, filtered, washed with water and dried to give a gray solid was filtered and dried to give the product 31. 77g, 90. 77% yield. 在反应瓶中加入30g式V化合物，DMAClOOml，氨基钾0. 47g。  30g of formula V compound is added, DMAClOOml, 0. 47g potassium amide reaction flask. 150°C保温反应5小时。 150 ° C incubation for 5 hours. 反应液60°C减压浓缩，倒入快速搅拌的冰水中，析出紫色固体。 The reaction solution was concentrated under reduced pressure to 60 ° C, poured into rapidly stirred ice water to precipitate a purple solid. 过滤，滤饼在醋酸中常温搅拌一小时，过滤，水洗，干燥，得到产物19. 79g，收率76. 2%。 The filter cake was stirred in acetic acid at room temperature for an hour, filtered, washed with water, and dried to give the product 19. 79g, yield 76.2%. 将式VI化合物10. 03g在丙酮：甲醇=1 :1的100ml溶液中，加入10%钯碳1. llg， 氢气压力在3~4个大气压下40°C下搅拌反应3小时，过滤，滤饼溶于二甲基亚砜20ml 中，滤除钯碳，滤液加入水l〇〇ml中，搅拌析出固体，水洗滤饼，干燥得到产物6.19g，收率68. 33%，纯度99.58%。  10. 03g The compound of formula VI in acetone: methanol = 1: 100ml solution 1 was added 10% palladium on carbon 1. llg, stirred at a hydrogen pressure of 3-4 atm 40 ° C for 3 hours, the filter cake was dissolved in 20ml of dimethylsulfoxide, palladium on carbon was filtered off, the filtrate was added water l〇〇ml stirred to precipitate a solid, the filter cake was washed with water, and dried to give the product 6.19 g, yield 68.33%, purity 99.58%. 2. 如权利要求1所述的制备方法，其特征在于：步骤（1)中，所述的碱性试剂选自醋酸钠、醋酸钾、醋酸胺、三乙胺、碳酸氢钠、二异丙基乙胺中的一种或几种混合物；步骤（1)的反应在反应溶剂A中进行，所述反应溶剂A选自醋酸、N，N-二甲基甲酰胺、N，N-二甲基乙酰胺、乙腈、丙酮中的一种或者几种的混合物。 2. The method as recited in claim 1, wherein: step (1), the alkaline agent is selected from sodium acetate, potassium acetate, ammonium acetate, triethylamine, sodium bicarbonate, diisopropyl one or more of the amine mixture; reaction step (1) a solvent in the reaction, the reaction solvent a is selected from acetate, N, N- dimethylformamide, N, N- dimethyl acetamide, acetonitrile, acetone, one kind or a mixture of several of. 3. 如权利要求2所述的制备方法，其特征在于：步骤⑴中，反应在室温~溶剂的回流温度范围内进行。 The production method as claimed in claim 2, wherein: the step ⑴, the reaction is carried out at room temperature to the reflux temperature of the solvent. 4. 如权利要求1所述的制备方法，其特征在于：步骤（2)中，式（IV )化合物关环得到式（VI)化合物的反应采用的关环试剂A选自氯化亚砜、二环己基碳二亚胺、三氯氧磷或羰基二咪唑，所述关环反应在反应溶剂B中进行，反应溶剂B选自干燥的N，N-二甲基甲酰胺、 N，N-二甲基乙酰胺、四氢呋喃、卤代烃中的一种或者几种的混合物。 4. The method as recited in claim 1, wherein: step (2), Formula (IV) ring closure to give a compound of the reaction of a compound of formula (VI) used in the ring closure agent A is selected from thionyl chloride, dicyclohexyl carbodiimide, phosphorus oxychloride or carbonyl diimidazole, the ring closure reaction is carried out in a reaction solvent B, a reaction solvent is selected from the group B of dry N, N- dimethylformamide, N, N- dimethylacetamide, tetrahydrofuran, a halogenated hydrocarbon or a mixture of several. 5. 如权利要求4所述的制备方法，其特征在于：步骤（2)中，式（IV )化合物关环得到式（VI)化合物的反应在-40~80°C之间进行。 5. The method as claimed in claim 4, wherein: the step (2), Formula (IV) ring closure to give a compound of the reaction of a compound of formula (VI) is performed between -40 ~ 80 ° C.
6. 如权利要求1所述的制备方法，其特征在于：步骤（2)中，式（V )化合物关环得到式（VI)化合物的反应采用的关环试剂B选自氨基钠、氨基钾或氨基锂，该关环反应在反应溶剂C中进行，反应溶剂C选自干燥的N，N-二甲基甲酰胺、N，N-二甲基乙酰胺中的一种或者两种的混合物。 6. 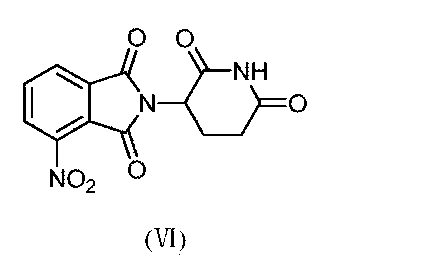 The method as recited in claim 1, wherein: step (2), the formula (V) to give a compound of cyclization reaction of the compound of formula (VI) used in the ring closure agent B is selected from sodium amide, potassium amide or a lithium amide, the ring closure reaction is carried out in a reaction solvent C, the reaction solvent is selected from C dry N, N- dimethylformamide, N, N- dimethylacetamide one kind or a mixture of two . 7. 如权利要求6所述的制备方法，其特征在于：步骤（2)中，式（V )化合物关环得到式（VI)化合物的反应在50°C~250°C之间进行。 7. The method as recited in claim 6, wherein: the step (2), the formula (V) to give a compound of cyclization reaction of the compound of formula (VI) is performed between 50 ° C ~ 250 ° C.
8. 如权利要求1所述的制备方法，其特征在于：步骤（3)中，所述的硝基还原以钯炭为催化剂，以H2或甲酸铵为还原剂，该硝基还原反应在反应溶剂D中进行，所述反应溶剂D选自丙酮、甲醇、乙醇、四氢呋喃、N，N-二甲基甲酰胺、N，N-二甲基乙酰胺、醋酸中的一种或几种的混合物。 8. The method as recited in claim 1, wherein: step (3), the nitro group reduced to palladium on charcoal as catalyst, H2 or ammonium formate as a reducing agent, reduction of the nitro group in a reaction solvent D is carried out, the reaction is selected, ethanol, tetrahydrofuran, N, N- dimethylformamide, N, N- dimethylacetamide, acetone and methanol mixture solvent (D) one or more of acetic acid . 9. 如权利要求8所述的制备方法，其特征在于：步骤（3)中，硝基还原反应在室温~ 50°C之间进行。 The production method as claimed in claim 8, wherein: the step (3), a nitro group reduction reaction is carried out between room temperature ~ 50 ° C.
10. 如权利要求1所述的制备方法，其特征在于所述制备方法按照如下进行： (1) 在醋酸中，式（I )所示的3-硝基邻苯二甲酸酐与式（II )所示的D，L-异谷氨酰胺或式（III)所示的D，L-谷氨酸二甲酯在醋酸钠存在下于回流温度之间进行反应，得到相应的式（IV )或式（V)化合物； (2) 在N，N-二甲基甲酰胺中，式（IV)化合物在氯化亚砜的作用下于-20~20°C进行关环得到式（VI)化合物；或者， 在反应溶剂C中，式（V )化合物在关环试剂B的作用下于120~150°C进行关环得到式（VI)化合物，关环试剂B选自氨基钠或氨基钾，反应溶剂C选自干燥的N，N-二甲基甲酰胺或N，N-二甲基乙酰胺； (3) 在甲醇中加入式（VI)化合物和钯炭催化剂，加入甲酸铵或者通入氢气作为还原剂，于30~40°C进行硝基还原反应，得到式（VII)所示的泊马度胺。 (1) in acetic acid, 3-nitro phthalic anhydride with the formula (Formula (I), in II: 10. The production method of claim 1 prepared according to the method follows the preceding claims, characterized in that ) shown in D, D L- or the isoglutamine of formula (III) shown, L- glutamic acid dimethyl ester in the presence of sodium acetate in the reaction between the reflux temperature, to yield the corresponding formula (IV) or of formula (V) compound; (2) in N, N- dimethyl formamide, formula (IV) ring closure to give compound of formula (VI) at -20 ~ 20 ° C under the action of thionyl chloride ring closure of formula (VI) or a compound, in a reaction solvent C, the compound of formula (V) reagent B action in the ring closure to 120 ~ 150 ° C, B ring closing reagent is selected from sodium amide or potassium amide; compound the reaction solvent is selected from C dry N, N- dimethylformamide or N, N- dimethylacetamide; (3) was added of formula (VI) compound in methanol and palladium on carbon catalyst, or by addition of ammonium formate hydrogen gas as a reducing agent, to the nitro group reduction reaction is 30 ~ 40 ° C, to give an amine of formula Ma poise (VII) shown below. 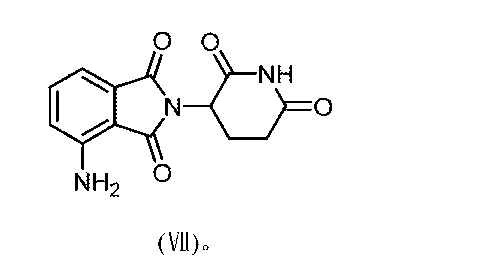 EP0572635A1 (en) 1993-12-08 Novel compounds having a guanidine structure and pharmaceutical composition containing same.